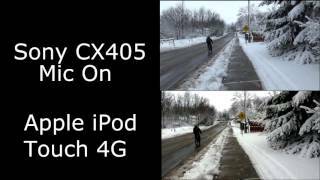 This video will be comparing the video quality and sound quality of the Sony CX405 Camcorder and the Apple iPod Touch. I test the two cameras at the same time in different environments. Basic video editing in Blender!! Thanks for the video. Does the quality drop when you import it to your laptop/desktop? I’m just wondering cause mine seems to; maybe it’s the fact that its mp4? Watching this I realise that the sound quality from the microphone of the CX405 is better without the wind reduction option on. The stabilization of the Cx-405 is superb. cx405 mic good for YouTube video?I mean it’s good as External Microphone? That was a great comparison. Very well done! I often use an ipod touch or an iphone to record video and was looking for something with image stabilization and better low light performance. I saw your video today and I ordered a Sony cx405. How’s your CX405 so far?